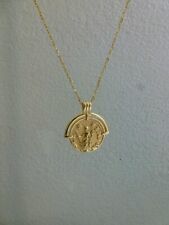 New Roman pendant coin necklace gold. Shipped with USPS First Class Package. ACTUAL ANCIENT ROMAN COIN- CONSTANTINE ERA- VARIOUS EMPERORS. 18" SILVER PLATED CHAIN INCLUDED- NICKEL/SILVER PLATE BEZEL. COINS ARE 1600 - 1800 YEARS OLD & IN GOOD / FINE SHAPE- NO JUNK. ACTUAL ANCIENT ROMAN COIN- CONSTANTINE ERA- VARIOUS EMPERORS. 18" SILVER PLATED CHAIN INCLUDED- NICKEL/SILVER PLATE BEZEL. Roman Star Coin Crystal Necklace Pendant YellowGold Plated Very Beautiful 16-18 inches Drops 6". 18" BRONZE/BRASS CHAIN INCLUDED- BRONZE/BRASS CABACHON LOCKET STYLE. COINS ARE 1600 - 1800 YEARS OLD & IN GOOD / FINE SHAPE- NO JUNK. 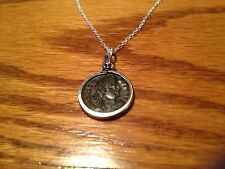 You are looking at a LARGEREPLICA ANCIENT ROMAN Septimius Severus COIN pendant necklace. Chariot can be worn on the reverse. These are sold as one of a kind necklaces. ACTUAL ANCIENT ROMAN COINS- CONSTANTINIAN ERA- VARIOUS EMPERORS. 18" ANTIQUE BRONZE CHAIN INCLUDED- BRASS BEZEL. COINS HAVE BEEN CLEANED AND ARE SHINY BRONZE WITH A CLEAR COAT. This beautiful necklace has a matte golden finish with a roman coin and red mogul cabochons. It is 23" long. Stunning piece! Penny in pictures for reference. Nice quality genuine ancient Roman imperial coins from 4th century AD. ONE BUY = ONE COIN PENDANT. SALE PRICE IS PER COIN PENDANT. Perfect for your next toga party or Roman Greek festival or usc game. Original and historic Roman coin pendant necklace from the height of Roman military power Constantine I (the Great) was a warrior emperor who ruled from 306 to 337 AD. 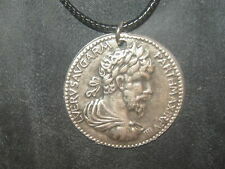 Pendants are available with either the front (emperor) of the coin or reverse (Roman military scene) showing. 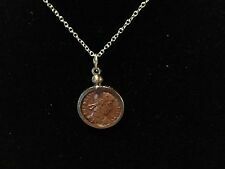 CHRISTIAN DIOR Signed Roman Coin Blinding Baguette Crystal Runway Necklace! It has a heavy weight and a matte gold tone finish. As emperor, Constantine enacted many administrative, financial, social, and military reforms to strengthen the empire. A new gold coin was introduced to combat inflation known as the solidus. Constantine pursued successful campaigns against the tribes on the Roman frontiers—the Franks, the Alamanni, the Goths, and the Sarmatians—even resettling territories abandoned by his predecessors during the Crisis of the Third Century. Chain Type: Fine Curb Chain. Material: S925 Sterling Silver. Other Details: "S925" Sterling Silver Stamping Mark. Fastening: Spring Ring Clasp. Color: Gold. Plating: 18K Gold. We promise we'll work with you to until you are satisfied. Approx: Necklace: 24.0" (L) EXT 3.0" (L). more Great Deals. A Must Have Jewelry Accessory For Your Collection. Description: This gorgeous gold tone link necklace features a variety of vintage inspired dangle accent pendants- a key, a bee, rhinestone studded shapes, faux pearls and more! Brand: WHBM, White House Black Market Measurements: 16 inch length ~4 inch extender chain Colors: Gold, Multi-color accents Condition: Great! Condition Notes: There may be light surface scratches/wear associated with age and use. Dainty and Beautiful. Lobster Closure. Longer Layer: 20" (L). A Must Have Jewelry Accessory For Your Collection. 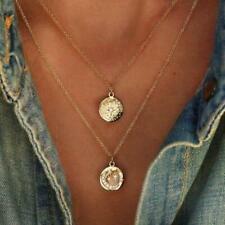 Really cute gold Roman orb coin necklace, perfect for layering or looks fab on its own! 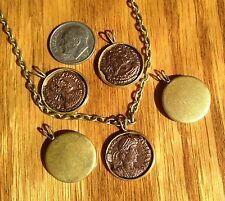 Coin jewellery is a key trend and has been seen on many bloggers! Necklace measures 23 cm at shortest, or can be adjusted to 26.5 long. Matching earrings in last pic also available in separate listing. Very Missoma style! US Nickel in pictures for reference. Nice quality genuine ancient Roman imperial coins from 4th century AD. SALE PRICE IS PER COIN PENDANT. ONE BUY = ONE COIN PENDANT. Dainty and Beautiful. Longer Layer: 20" (L). A Must Have Jewelry Accessory For Your Collection.